Are you looking for an easy way to stay committed to your plant-based diet? Why not consider trying a meal delivery service like MamaSezz? They provide their customers with pre-made vegan meals that are crafted with only the best ingredients. All you need to do is heat them up and enjoy. That means no cooking! Their meals are 100% plant-based and have been created as an easy way to get in a balanced diet while maintaining a vegan lifestyle. You can do it while enjoying some of your favorite dishes like macaroni, chili, and pasta. Does all that sound good? Read on to learn more about MamaSezz, how you can order meals from them, and our experience! One of the things we liked most about MamaSezz is that they don’t lock you into any kind of weekly subscription if you don’t want to be. This gives you the opportunity to try out their vegan meal delivery service before committing long-term. They do offer subscriptions on all of the bundles they provide, but there are no subscriptions when purchasing a la carte meals. Family Bundle: As the name suggests, this bundle is perfect for feeding a family (preferably 4 people). It includes Millie’s Chili, Veggie Loaf, Kid-friendly Love it Loaf, Mac Attack, Lazy Lasagna, and Granola. Get Me Started Bundle: Have limited time? Don’t want to spend it cooking? This is the bundle for you. It includes pre-made meals that are super-simple to make so you can heat, eat, and get on your way. Here’s what it includes: Millie’s Chili, Veggie Loaf, Lazy Lasagna, Gardener’s Pie, Moroccan Stew, and Granola. Healthy Senior Bundle: Are you a senior looking to start eating healthier? Is there a senior in your life who wants to make the switch to a plant-based diet? There are tons of health benefits associated with the vegan diet. However, you want to make sure you’re eating balanced meals. That’s where a meal delivery service like MamaSezz can help. This bundle includes Quinoa Side Dish, Millie’s Chili, Veggie Loaf, Lazy Lasagna, Gardener’s Pie, Bolognese with Rice Pasta, Gram’s Granola, Maple Walnut Granola, and Chia Chai Yoga-Nola Granola. Heart Healthy Bundle: Research suggests that a vegan diet can have a positive influence on heart health, especially for those with heart disease. This bundle includes Millie’s Chili, Veggie Loaf, Gardener’s Pie, Bolognese with Pasta, Moroccan Stew, and Marinara Sauce. Just For Me Bundle: Looking for a meal delivery service for one person? This bundle is a great option. It feeds 1 person for 10 days and includes Gardener’s Pie, Lazy Lasagna, Bolognese Pasta, Mac Attack, Quinoa Salad, Cajun Mashed Potatoes Side Dish, Scalloped Potatoes Side Dish, and Granola. Lunch Box Bundle: The toughest time to be vegan is lunch time at work. There aren’t a ton of vegan options at local restaurants. That’s why MamaSezz created this bundle. Now you can bring healthy vegan lunches with you to work or wherever you may be. 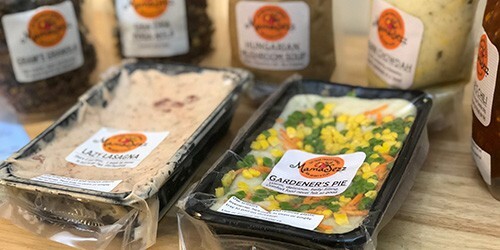 This bundle includes Gardener’s Pie, Lazy Lasagna, Bolognese Pasta, Quinoa Salad, Millie’s Chili, Scalloped Potatoes Side Dish, and Granolas. Plant-Based Challenge Bundle: If you don’t currently follow a plant-based diet, making the switch can seem intimidating. MamaSezz created this bundle to help get you started. These meals will introduce you to a vegan diet without being too “out there”. This bundle includes Southwest Quinoa, Millie’s Chili, Veggie Loaf, Mac Attack, Gardener’s Pie, Lazy Lasagna, and Granola. Soups, Sauces, and Sides Bundle: The perfect plant-based addition to any meal or enjoyed solo. This bundle includes Hungarian Mushroom Soup, Millie’s Chili, Corn Chowdah, Marinara Sauce, Bolognese Sauce, Mama’s Mac Sauce, Cajun Mashed Potatoes, Cauliflower Rice, and Cornbread. Surprise Me Bundle: Love surprises? If so, this is the bundle for you. It comes with a bunch of exclusive vegan goodies that haven’t yet been released. That means you become the first to try out brand new meals/snacks they’re working on. If you’re someone who needs to be in control of what you receive, you can always order meals a la carte. There are meals for dinner, lunch options, side dishes, and snacks. They even provide kid-friendly meals for those who need to feed their whole family. There are tons of different options. Since there’s no minimum required for your order, you can pick and choose whatever you like and add it to your cart. Once you’ve chosen everything you want, whether it’s a bundle or a la carte dishes, you simply need to check out and you’ll receive an order confirmation email. You’ll eventually receive an email confirming that your meals have shipped. Then, you can sit back and wait for everything to arrive on your doorstep. Don’t forget to add some snacks like the Chia Chai Yoga-Nola, Maple Walnut Granola, or my personal favorite Gram’s Granola for a tasty treat in between meals. The MamaSezz headquarters are located in Keene, New Hampshire, so all of the orders will ship out from there. They’re able to ship orders to all of the United States. This is pretty amazing considering most local meal delivery companies only ship to locations they are close to. Where you’re located will dictate the cost for shipping, as they have four different shipping zones. Zone 1 includes Connecticut, Delaware, Indiana, Kentucky, Maine, Maryland, Massachusetts, Michigan, New Hampshire, New Jersey, New York, North Carolina, Ohio, Pennsylvania, Rhode Island, Tennessee, Vermont, Virginia, Washington DC, and West Virginia. These locations will get free shipping on orders over $89. Orders under $89 will cost $19.95. Zone 2 includes Alabama, Florida, Georgia, Illinois, and South Carolina. These states will have to pay $19.95 per box for orders $89 and over. And orders under $89 will cost $39.95 for shipping. All other states within the continental United States are considered Zone 3 and will have to pay $69.95 for shipping on orders over $89 and $88.95 for shipping on orders under $89. Zone 4 includes Hawaii and Alaska, where your shipping costs $130 per order. 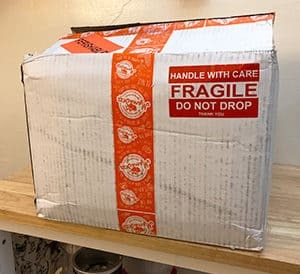 The shipping costs are a bit steep the farther you are away from their headquarters but this is because they need to ship it as quickly as possible so the meals don’t go bad in transit. MamaSezz ships orders on Wednesday every week, which means you’ll receive your order on Thursday or Friday, depending on where you’re located. You will be providing with a FedEx tracking number to keep an eye on delivery status after your order has shipped. There’s no need to be home to receive the delivery either since a signature is not required. FedEx will leave the box for you. You also have the option to pick-up your order if you’re located in Keene, New Hampshire or Brattleboro, Vermont. They have locations in each of these areas, which enables you to swing by and pick up your food when the order is ready and also avoid shipping charges for cheaper orders. To ensure your meals stay fresh as they make their way to your home, MamaSezz uses specially designed packaging to keep food cold. They use eco-friendly boxes that act as a mini-fridge during transportation. These are reusable boxes, so they send a return-shipping label to encourage customers to send the boxes back to their facilities. To return the box, all you have to do is schedule a free pick-up with FedEx to get started. You’ll then place the empty packaging and shipping materials into the box, apply the return label, and leave it outside on the day of pick-up. The box will be shipped back to MamaSezz, where they will handle the recycling for you. They go above and beyond to ensure that their packaging is as green as possible by reusing them. This makes them one of the most environmentally friendly vegan meal delivery services we’ve had the pleasure of trying. Striving to provide quality ingredients to their customers, MamaSezz sources ingredients from a number of local farms. For instance, they use organic produce in their meals, which they’ve sourced from farmers in Vermont and in New Hampshire. This allows them to know exactly where their ingredients are coming from, which is reassuring. Once the ingredients are gathered, they make the meals in a licensed kitchen in Keene, New Hampshire. Everything is made without meat, no refined sugar, no GMOs, no dairy, no gluten, and no preservatives. Removing all of these things means you can feel good about each of the meals you order from them. An added bonus is that they also avoid using oil in cooking their meals. This is something that we haven’t seen from any other meal delivery service. Their pre-made meals are never frozen, but are delivered to you fresh and fully prepared. You’ll notice there’s a “use or freeze by” date on all of your meals. That date is typically within 10-14 days of your delivery. If you aren’t going to be able to eat the meals within that time frame, you can put them in the freezer for up to two months. Since MamaSezz handles all the preparation for you, there’s very little work to do on your part. You don’t even need to wash veggies and chop them up or prepare anything in advance—it’s all taken care of for you. Once you’re ready to eat, you simply need to follow the heating instructions on the packaging. Within a matter of minutes, you’ll have a fresh, nutritious meals to enjoy. Overall, this was one of the quickest pre-made meal delivery services we’ve used. In our box we received their Hungarian Mushroom Soup, Corn Chowdah, Millie’s Chili, Gardener’s Pie, Lazy Lasagna, Chia Chia Yoga-Nola, and Gram’s Granola. We found Millie’s Chili to be the perfect dish for a cozy night in. It’s so hearty and full of veggie-goodness you’ll forget that it doesn’t have any meat. It’s loaded with kidney beans, garbanzo beans, black beans, corn, carrots, and sweet potatoes, which all provide so much flavor to the dish. The Lazy Lasagna, which we tried in our video review, was delicious. To be honest, it’s hard to distinguish this vegan and gluten-free lasagna from the real thing. Why? It has the same flavor and really tastes like you’re eating lasagna. I don’t how they worked their magic to create this one. The granola’s were both great mid-day snacks. Both were not too dry and not too crunchy. I found myself reaching for them when I was in need of an energy snack to help me “power through” the day. The price you pay will obviously depend on what you choose to order. All of the bundles cost $99, with the exception of the Healthy Senior Bundle and the Lunch Box Bundle which cost a bit less at $89. Depending on which shipping zone you live in, these bundles are enough to get you free shipping on your order. If you’re outside of Zone 1, shipping will cost at least $19.95 when purchasing a bundle from MamaSezz. If you’re prefer to order your meals a la carte, you can do that as well. The dinner options typically cost around $15.99 each. The cheapest option is $9.99 for the Kid-Friendly Love it Loaf. All of the side dishes cost $6.99 and the sauces are $12.99. If you’re looking to add a snack onto your order, that’s an additional $12.99 for each one you want. MamaSezz is definitely worth checking out if you’re looking for healthy, plant-based meals that have been prepared for you. It takes all the effort out of preparing meals because all you need to do is heat them up and enjoy. Eating nutritious meals has never been easier, plus you don’t have to worry about where the ingredients have come from. Knowing that everything is organic, from local farms, and void of all those bad additives (e.g. gluten, GMO’s, and preservatives) is very reassuring. Although their shipping fees are a bit high if you live far away from their headquarters and they might not have a gigantic menu of meals to choose from, the ones they do have are full of flavor and incredibly easy to make. Disclaimer: We received a box of free meals from MamaSezz to provide our honest opinion. We were not paid to say any of this and this is not an advertisement. Have a question about MamaSezz or vegan meal delivery? Leave a comment below and we’ll get back to you ASAP!